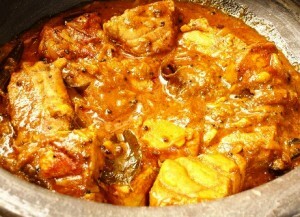 Fish Curry recipe by Zeba at DesiRecipes.com. Wash the fish and remove the scales, if any and cut the fish into 1 inch steaks. If the fish is boneless (fish fillets), then cut into 1 inch pieces. Mix the lemon juice and 1 teaspoon salt and rub on the fish pieces and leave to marinate for 30 minutes. Meanwhile prepare masala (gravy), heat oil in a heavy based pan and stirring frequently, fry the onions to light brown. Add ginger and garlic and stir fry for 3-5 minutes or until the mixture is golden brown. Add 2-3 tablespoons of water to prevent from burning. Add chili powder, turmeric , coriander powder, garam masala powder, remaining salt and 3-4 tablespoons of water to prevent the spices from burning. Stir fry for a minute or two and then add chopped tomatoes. Stirring frequently, fry the mixture for 8-10 minutes or until tomatoes are reduced to a pulp and oil begin to separate from gravy. Add fish and stir well to coat the fish pieces with spice mixture. Reduce the heat to low, cover with a tight fitting lid, and cook for 15-20 minutes or until the fish is tender, stirring occasionally. (It may be necessary to add extra water to prevent the fish from sticking to the bottom of the pan.) Adjust the seasoning with salt . At the end of the cooking time add coriander leaves and chopped chilies. Carefully transfer to a serving dish and serve with Chapati or boiled rice. This is a lovely recipe. I wanted somethng spicy to appeal to my fish-averse male members of the family, but without coconut which I cannot stand, and this did the trick (especially with added red chillis!). Gorgeous! This was DELICIOUS. I did it almost exactly to the recipe (mostly because I didn't know what I was doing) and I don't think I'd change a thing. I could've gone for a bit more heat (spicy), but the flavors were amazing.